For many students, getting hands-on opportunities to work with primary source materials can be an indelible experience. We recognize that it can be intimidating to get started, so Graham Library and Trinity Archives offer class visits for students to get acquainted with rare and archival materials. Over the fall we had a number of visits from Trinity College students and even a class from the University of Guelph. 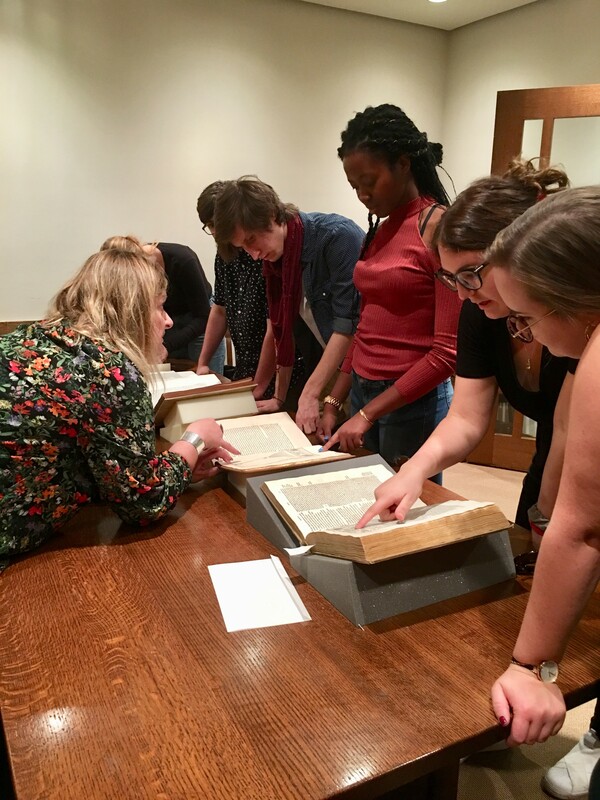 In September, Cataloguing & Digital Services Librarian, Kate MacDonald, welcomed Professor Sally Hickson’s fourth year seminar class from the University of Guelph to work with our 1599 copy of Hypnerotomachia Poliphili (featured on our blog as our February 2017 Rare Book of the Month). The class was studying the development of illustrated books in Venice. Besides the Hypnerotomachia, the class compared it to an illustrated 1497 copy of Dante’s Divine Comedy printed by Pietro Quarangi, as well as other titles printed by Aldus Manutius, the famed Venetian printer. Experiencing the books in-person enables students to understand the physicality of rare printed texts and provides a greater understanding of early print technologies, which is difficult to achieve even with high quality digital reproductions. 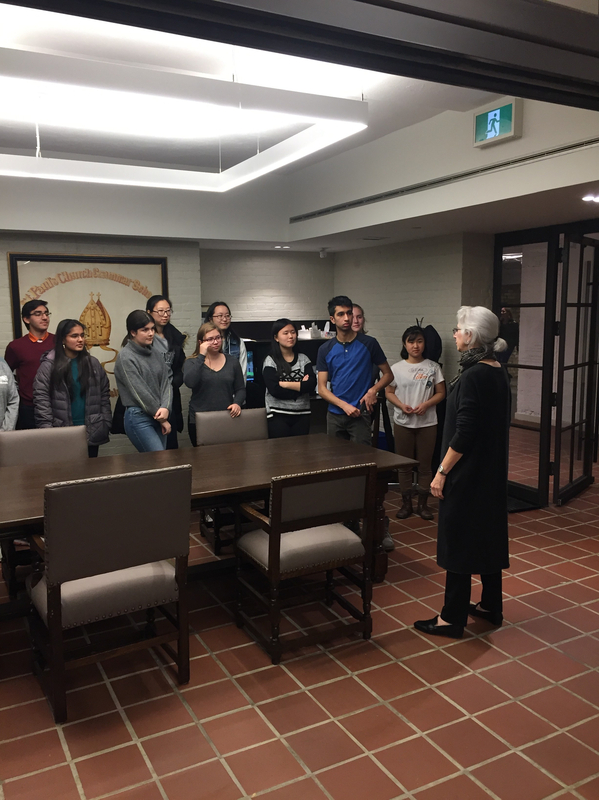 Trinity College’s Rolph Bell Archivist, Sylvia Lassam speaks to students. 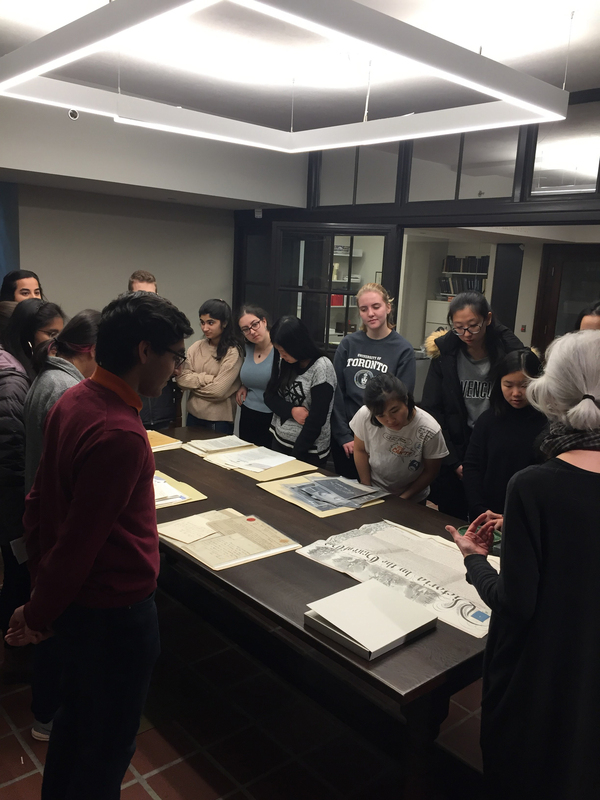 Students view Trinity College’s Charter and other archival documents. In November, students from the Margaret MacMillan Trinity One programme visited the Trinity College Archives. Rolph-Bell Archivist Sylvia Lassam and Student Outreach & Archival Projects Librarian Christopher Hogendoorn introduced them to the concept of archival research and physically interacting with primary source materials. The students viewed some of the archives’ most interesting records including: Michael Ignatieff’s family photo album (the inspiration for his book The Russian Album, a history of his Russian aristocratic grandparents exiled after the 1917 Revolution); the College’s Royal Charter (the legal document granting Trinity’s status as a university complete with the Queen’s seal, which has been melted), and a collection of letters related to bringing British Home Children to Ontario. The selection demonstrated the range of materials considered to be archival records. And in the case of the Home Children letters that are written in cross hatched script, showed students some of the challenges they may encounter in reading historical manuscript letters. Both the Graham Library’s Rare Books and Special Collections and Trinity College Archives are open to all faculty and students interested in using the collection. Faculty members are welcome to find out more about booking a class visit by contacting either Kate.macdonald@utoronto.ca at Graham Library, or Sylvia Lassam at archives@trinity.utoronto.ca to discuss arrangements.